Many men suffer from excess weight and localized accumulations of fat that they cannot get rid of despite exercise or diet. In men, the areas most commonly affected are the abdomen and the hips (love handles). Such accumulations of fat can be removed with the use of a vacuum device. The objective of male liposuction is to contour the shape of the body in such a way as to give it the best possible form with the least amount of remaining fat. Today, liposuction is gaining significant popularity among men. The popularity of male liposuction in Virginia is perhaps due to its relative simplicity (in the hands of a qualified surgeon). Large amounts of fat can safely be removed through incisions that are barely visible. The fat that is removed never comes back. However, you must remember that it is impossible to remove all fat cells, and the ones that remain may get enlarged if you do not control your dietary intake. In recent years, modern methods of male liposuction have virtually eliminated all dangers. The technique of tumescent liposuction has made it possible for the surgeon to remove large amounts of fat without the need for a blood transfusion, which was necessary in many large suctioning procedures in the past. There is much less discomfort and a shorter recovery time with this technique. Ultrasonic liposuction is a method that uses ultrasounds to first break down the fat. Once the fat is emulsified, it is removed with regular suction cannulas. Ultrasound is generally used in fibrous areas of the body, such as the back and the breasts. It is also helpful in secondary liposuction procedures. Technological advances are being made in other areas that are now challenging traditional liposuction as the most efficient method of fat reduction. The use of laser technology in liposuction (SmartLipo) is still in its preliminary stages, and its advantage over more conventional techniques is yet to be proven. Mesotherapy and lipodissolve are techniques that use injectable agents to dissolve fat. These methods are gaining popularity through the media; however, in the professional community, there is some skepticism for the use of these solutions in large volume fat reduction. Until the safety and efficacy of these methods is established beyond any doubt, it is safer to use traditional techniques of fat removal. The Virginia male liposuction procedure can be done under local anesthesia plus sedation or under general anesthesia, depending on the extent of surgery. The vacuum suction is inserted into the fatty layer of skin through a small incision, and fat is removed. It is important to understand that male liposuction is not a substitute for proper diet and exercise. The best liposuction candidates are those who have localized accumulations of fat. The elastic property and tone of skin are also important in achieving good results. If your skin has poor elasticity, Dr. Marefat may recommend a skin-tightening procedure in conjunction with liposuction. Although skin removal is effective in eliminating the excessive laxity, it does leave permanent scars. After Virginia male liposuction surgery, you will wear a compression garment in order to minimize the swelling in the suctioned areas. Wearing this garment for 1-2 months ensures proper healing and recovery. Depending on the extent of the surgery, you may be able to resume normal activities the same day, or you may need a week to recover. Generally, recovery is complete no matter how extensive the procedure is by the end of the 1st week. Rigorous and strenuous activities should be avoided in the first few weeks. Lipoplasty, also known as suction lipectomy (liposuction), is one the most frequently performed cosmetic surgery procedures in many countries around the world. Although this procedure is very safe, there are still serious risks that may attend it. It must be remembered that liposuction is performed by many health care practitioners who are not trained in plastic surgery. Dermatologists, internists, gynecologists, oral surgeons, otolaryngologists, and even some dentists have been known to perform liposuction. Liposuction should be performed in a facility that has the equipment and personnel to deal with life-threatening situations. In the past several years, the American Society of Plastic Surgeons has recommended a maximum of 5000cc of fat removal in one day. Since this rule has been established, the number of deaths as a result of liposuction performed by board certified plastic surgeons has dramatically decreased. Liposuction is a procedure designed to remove unwanted fat with minimal incisions. The most suitable patients are those who have reasonable expectations about the results that they will achieve with this type of surgery. It is useful for patients who have localized fat accumulations that are disproportionate to the remainder of the body. On occasion, body contour irregularities can also be helped with liposuction. Who is not a good candidate for the male liposuction procedure? For many patients who have excessive skin or who have lost the elasticity of their skin, a traditional skin resection may be necessary. If body contouring irregularities are due to structures other than fat, such as bone or weaknesses in the muscles, these problems cannot be corrected by liposuction. On occasion, it may be necessary to address these problems at a later date with other surgical procedures. What does male liposuction accomplish? 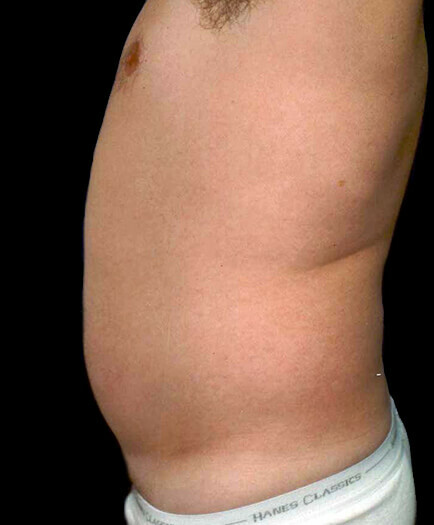 With Virginia male liposuction, fat can be taken away permanently. Each person is born with a specific number of fat cells. These fat cells get larger or smaller depending on the amount of calories consumed or the metabolism of the person. When fat cells are removed from an area of the body, the fat never comes back. You will still have some fat cells remaining in that area, but, the procedure, if done correctly, will have long-lasting effects. Will male liposuction treat cellulite? Not usually. Cellulite is located in a more superficial layer and is not usually removed with liposuction. If the patient has cellulite, it is likely that the areas of cellulite will still be present after surgery and, on occasion, may become even more noticeable. What happens during the first consultation for male liposuction in Virginia? In the first consultation, you will have a chance to discuss your concerns with our patient care coordinators and Dr. Marefat. We will explain what you need to know about the Virginia male liposuction procedure and help to determine what is best for you. You will receive information booklets and pricing on the procedure. Liposuction is done through a small puncture hole that is usually hidden in a natural fold of the body. The incision itself can be as small as 1/8th of an inch. The area to be suctioned is then infiltrated with a solution containing medicines that reduce bleeding and postoperative pain. This is why large amounts of fat can be removed with little blood loss and no need for hospitalization. What are the goals of male liposuction? Our objective is to improve body contours. However, we cannot change the nature of the skin. We want to establish more normal proportions between the areas of the body and give the body a better overall harmony. We also want to improve the appearance both in and out of clothing. What kind of anesthesia will I have for male liposuction? It depends on how much liposuction you need. Local anesthesia, IV sedation, or general anesthesia can all be used for this surgery. In all cases, the local injections of the tumescent solution are used whether or not you are asleep. With the tumescent technique, requirements for IV sedation or general anesthesia are decreased, so there is less risk of side effects as a result of these anesthetics. Some patients are very uncomfortable about being awake during the procedure, and, in such situations, it is best to opt for general anesthesia. What can I expect after male liposuction? After male liposuction surgery, you will have a moderate amount of drainage from the liposuction incisions. You will need to rest for the first 2-3 days, but most people are up and about shortly after surgery. We generally recommend our patients take off 5-7 days from work. Heavy lifting and exercising should be avoided in the first 2 weeks. Your body will tell you when you are ready to get back into your regular exercise routine. You will need to wear support garments for approximately 4-6 weeks after surgery. This helps in the attachment of the skin back to the underlying tissues after liposuction and reduces the chance of fluid collection under the skin. During this interval, you may remove the garment to shower and rest your skin for short periods of time. There will be some numbness associated with Virginia male liposuction surgery. This numbness usually persists for about 4-6 weeks. Minor lumps and irregularities are common after liposuction. These irregularities are related to accumulations of fluid in certain areas of the subcutaneous fatty layer of the skin as a result of either infiltration of the fluid or as a result of the trauma associated with liposuction. Irregularities even out after the first 2-3 weeks of surgery. Minor asymmetry between the 2 sides of the body can be seen after liposuction. This is related to accumulations of fluid or trauma related to the operation. These asymmetries usually resolve within 2-3 weeks after the surgery. Will there be waviness and irregularities after male liposuction? Not usually. This is still the most common aesthetic complication of liposuction. It seems to occur more in people with poor skin quality and patients who have cellulite. One way to avoid waviness and irregularities is for the doctor to use very small gauge cannulas and to take his time removing the fat. However, even when everything is done right, there is still a chance that you may develop some irregularity. If this occurs, we can usually fix this problem in a touch-up procedure. This touch-up procedure is done approximately 3 months after the initial surgery. What are some of the complications of male liposuction? Reading about complications can be quite scary. Many people cannot comfortably sit through a consultation session without having some real doubts about surgery. But it is different when you have these complications explained to you by Dr. Marefat. He can put them in perspective for you and tell you the likelihood of such complications occurring. Most complications are very rare. Some are less rare and need to be explained in more detail so that you know how we would tackle these problems if they occurred. The purpose of explaining risks and complications is for you to know what steps we would take to treat you and put you back on the road to recovery. Remember that every surgeon has his or her own way of treating problems. You must go over these potential risks with your surgeon to gain better insight and understanding. Bleeding: This is very uncommon with liposuction because we are generally not cutting tissues but using a blunt-tipped cannula to remove the fat. However, there have been some reports in the literature of bleeding as a complication. There are those who are at higher risk of bleeding. The use of some medications, such as aspirin or blood thinners, could put you at higher risk of bleeding. If you are contemplating surgery, you should refrain from using aspirin-containing products from 2 weeks before surgery until 2 weeks after surgery. Some people with a history of uncontrolled hypertension can be at higher risk of bleeding after the surgery. There are some individuals who are unaware of problems with their coagulation system and, consequently, have had bleeding after surgery. If you have bleeding after surgery, it may entail returning to the operating room to stop it. Skin discoloration: This can occur in any surgery. It is due to blood metabolites and is usually temporary and self-limiting. Sometimes, these blood pigments stay in the subcutaneous tissues permanently. This is very rare and generally occurs in patients with darker skin complexions. If this occurs, we may need to treat your skin with certain bleaching agents, which can help correct the problem. Discomfort and pain: This is easily controlled with oral pain medications. With the use of the tumescent technique and the use of the local anesthetics in the tissues, both the pain and the discomfort should be minimized. Temporary numbness: Numbness associated with the surgery usually persists for several weeks, depending on the extent of surgery performed. Most of this numbness subsides after 7-10 days. However, it is not unusual to see persistent numbness even after 4-6 weeks have passed. Minor lumps and irregularities: These irregularities are related to accumulations of fluid in certain areas of the subcutaneous fatty layer of the skin, as a result of either infiltration of the fluid or trauma associated with surgery. Irregularities even out after the first 2-3 weeks after the surgery. Minor asymmetry: Minor asymmetry between the 2 sides of the body can be seen after the liposuction. This, too, is related to accumulations of fluid or trauma related to the operation. These asymmetries usually resolve within 2-3 weeks. Permanent scars: Scars are present whenever there is any incision. Almost all operations will involve some scarring. The extent of the scar will depend on the nature of the problem and the extent of surgery. Liposuction puncture wounds are minute, and in 2-3 months, they heal so well that they are barely visible. Other operations may have more extensive incisions, which may cause more scarring. The nature and extent of the scar also depends on the location of the incision and your genetic ability to heal scars. Dr. Marefat rarely sees cases in which the scar has become a major problem. However, if a scar does become prominent and visible, it can usually be improved with scar revision procedures. It is more prudent to wait approximately 1 year before attempting scar revision. Persistent edema: This problem is very rare, but if it occurs, it can be bothersome and may last for many weeks after surgery. Generally, this is not a permanent problem. The literature has noted only a few cases in which people have had problems with persistent edema. To prevent persistent edema, we encourage the use of the compression garments after surgery and as long as needed until the edema is resolved. Altered areas of sensation: On rare occasions, it is possible to have an area remain permanently numb or experience tingling. Usually, these problems are seen in cases where a skin resection is being performed at the same time as the liposuction. The liposuction can injure nerves in the area, and these injured nerves can later develop permanent scarring and problems related to nerve conduction. Usually, the surrounding nerves are able to cover the area of impaired sensation, and after 4-5 weeks, the area returns to normal. However, if this does not happen, the patient is left with an area that has permanent numbness or altered sensation. This may or may not be a correctable problem. Often, the size of the impaired sensory area is not much larger than a half dollar or a quarter, and most patients are not bothered by it. Surgical shock and pulmonary complications: There are certain uncommon risks and complications that can also occur. These include shock, which might require a transfusion. This is a very uncommon problem, and one that Dr. Marefat has not seen in his patients but is occasionally reported in the literature. Because of the tumescent technique, the need for autologous blood has been virtually eliminated. Seromas and hematomas: These are collections of fluid or blood under the skin. If this problem occurs, it will need to be drained. This is usually done with a syringe. To the patient, it will entail more frequent office visits after surgery until the problem is solved. Usually, these problems do not cause any permanent damage. Skin loss: This has been seen in a few cases with major skin undermining. Usually, this occurs in people who are smokers or who have some underlying problem with circulation. You are strongly encouraged to quit smoking 2 weeks prior to male liposuction surgery and to refrain from smoking until 2 weeks after surgery. Fat embolism: The literature has reported few cases of liposuction resulting in pulmonary fat embolism. This problem is very uncommon, and there is no clear explanation for why it occurs. It may be related to the entrance of fat into the blood vessels during the operation. These could travel to the lung and obstruct the pulmonary vessels. If this occurs as a result of the operation and is severe, the patient will need to be hospitalized. When and where are male liposuction touch-up procedures done in Virginia? Touch-ups are done after 3 months. These procedures are much simpler than the first procedure and are not as painful. Dr. Marefat can usually do them in the office with a small amount of local anesthetic solution. When are the sutures removed after liposuction? There are very few sutures in liposuction procedures in general. These usually come out in the first week. You may have absorbable sutures that do not need to come out. How many visits do I have after male liposuction in Virginia? We like to see our patients frequently after surgery. You are seen by the doctor or nurse within 2-3 days of Virginia male liposuction surgery. Then, the normal postoperative routine is 1 week, 1 month, 3 months, 6 months, and 12 months. Of course, if there is a need, you may be seen more often. After a year, we encourage our patients to come in for routine follow-up visits every 3-5 years. Am I a good candidate for male liposuction? You are a good candidate for Virginia male liposuction if you have localized areas of fat collection, good skin tone, good general health, and realistic expectations. This does not mean that you cannot have liposuction if you do not meet these criteria. However, the best results are seen in individuals who have 1-2 areas of localized fat on their body that they cannot seem to get rid of with dieting and exercising. Generally, the younger you are, the better a candidate you are for surgery. A person’s physiological age is more important than his chronological age. That is to say, you may be 60 years old, but your skin and general health may be better than that of most 50 year olds. How do I pay for liposuction? You can pay for Virginia male liposuction by certified check, credit card, or cash. Payment for cosmetic surgery is expected prior to any procedure. If you are scheduled for surgery several weeks in advance, you may pay by personal check. Are there scars associated with liposuction for men? Yes. However, these scars are very small (about 1/8th of an inch) and are usually hidden in areas of the body where you would not normally see them (e.g., belly button or pubic hair area). Each area of liposuction will generally have 1-2 small scars. After several months, these scars fade and are hardly visible. The pain involved in liposuction is very tolerable. We have heard our patients describe it as muscle aches and pains or just soreness. Many patients do not finish the pain medications prescribed to them for pain relief. Having said that, remember that pain is very subjective, and it is not easy to predict what degree of pain you will have. Will I be awake during liposuction? If you are having just a small area treated that can be done in the office, then you will be awake. However, if you are having a large area treated or having multiple areas suctioned, this will most likely be done in an outpatient facility using general anesthesia. Where will the liposuction surgery be performed in Virginia? Male liposuction surgery can either be performed in the office or the outpatient facility, depending on the size and number of areas suctioned. For example, if you have a small localized area of fat in your hip, it is quite feasible to do this in the office under local anesthesia. On the other hand, if you want to have your entire mid-body treated, then you are much more likely to have this done in the outpatient facility. We rarely see the need to perform male liposuction in the hospital setting anymore. Only in rare situations in which the patient may have risk factors does Dr. Marefat suggest surgery in a hospital environment. Are medical photographs taken of the liposuction procedure? How do I get started with male liposuction in Virginia? Dr. Marefat and the staff at Metropolitan Plastic Surgery would be happy to help you set up a private consultation to discuss liposuction for men. Schedule an appointment online or call one of our locations at 703-516-7600 (Arlington area) or at 703-560-9583 (Woodbridge). Are there financing options for male liposuction in Virginia? Dr. Marefat offers a number of financial assistance programs and payment programs to cover the cost of liposuction for men. Please visit the patient financing section of our website for more details or ask the staff at Metropolitan Plastic Surgery about these options so that you can get started with male liposuction in Virginia today.